The option to change account settings like your email address, password, displayed user name, and payment options can be found under Account > Settings. Changes can take up to 24 hours to take effect. 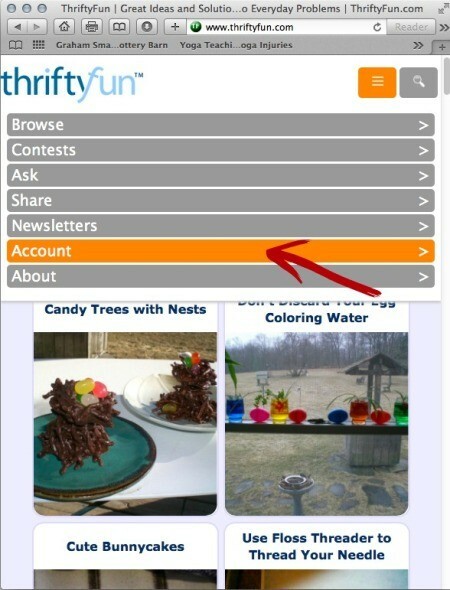 The Account link is found at the top right corner of ThriftyFun (under the search box) and once in Once you are in Settings, you will see tabs for "Email Address", "User Name", "Password", and "Payment". Select the tab for the option you wish to change, make your changes, and Click the "Change" button for that option. Account details, the settings link is in the sub-menu on the left. 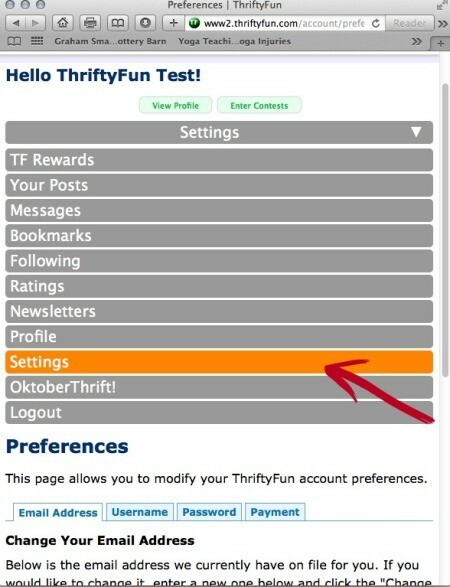 The top right corner of the ThriftyFun site will have a grey box with three white lines (it is next to the magnifying glass search icon). Click the grey box with the lines to access the Account Menu option. This will take you to your account details. It will default to "YOUR POSTS". Next to the words "YOUR POSTS" there is a white upside down triangle. Click this and you will see the Account sub-menu. Select Settings here. There will be a blue menu bar that says "Email Address" with a white upside down triangle. Click this and you will have the Email Address, Password, User Name, and Payment options. 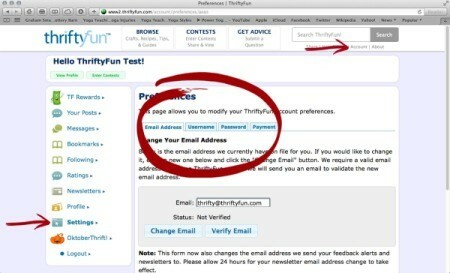 NOTE: Changing your email address here will also change your email address for the newsletters and feedback alerts. Generated 2019/04/18 10:24:03 in 65 msecs.